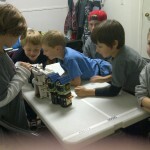 Coach Apparent Ltd offers an innovative group-based social skills development program using the LEGO® system. LEGO® play has been proven to be an effective way for children with social difficulties associated with Autism, Asperger Syndrome, Anxiety, Depression, ADHD or Adjustment Disorders to improve their social interaction and communication skills. Improvements in social competence enable children to sustain lasting friendships and reach their highest potential. How This Evidence-based Therapy Got Started LEGO® social skills program was developed over 18 years ago after observing that children with autism and other neurobehavioral disorders were naturally attracted to LEGO® when presented with a room full of toys. 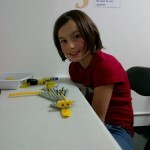 Using LEGO® in a therapeutic and structured way was fun and seemed to naturally reinforce appropriate social behavior. LEGO® social skills development has been systematically evaluated in research studies and has shown that using LEGO® as a modality for group interaction and communication with peers increased self-initiated social contact and the duration of social interaction in other group settings such as in the playground and school cafeteria, and improved social competence in general. Here’s How It Works: Children come together each week in developmentally staged groups from ages 6-12 years. 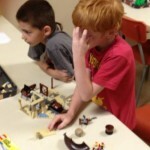 During the sessions they focus on collaborative projects in a specifically designed LEGO® room. To prompt interaction among the children and help them come up with their own solutions, trained Lego ® youth leaders and facilitators divide up tasks so they have joint and interactive jobs to do. This collaboration requires close interaction and communication among group members naturally reinforcing social contact and good behavior. The participants collaborate on building sets, freestyle projects and even make short “LEGO®-mation” stop-action films using digital video equipment. How Will This Help My Child? You will see your child identify with a peer group and begin to be motivated by social approval and social status within the group. It has been shown that to become a better LEGO® builder, children need to learn from each other, cooperate, solve disputes, follow rules, and be helpful. These skills are often learned and reinforced by their peers throughout the weekly sessions and generalize to school and home environments.